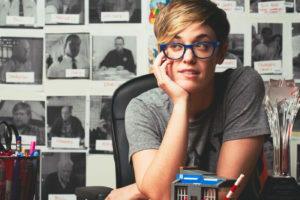 Lauren Morelli is currently showrunning and Executive Producing the first season of Tales of the City for Netflix, starring Laura Linney and Olympia Dukakis. Previously, she worked on the first five seasons of Orange Is The New Black, for which she wrote and produced eleven episodes. The show received 17 Emmy nominations, six Golden Globe nominations and six Writers Guild nominations. Recently, Lauren wrote and directed her first short film, HUM, starring Samira Wiley (Orange Is The New Black) and Hudson Yang (Fresh Off The Boat). In her spare time, Lauren also writes short stories and personal essays that you can find in various corners of the Internet. Before moving to Los Angeles in 2007, Lauren received a BFA in Modern Dance from Marymount Manhattan College, which was about as useful as her father predicted it would be. After graduation, she was a terrible assistant to a plethora of unsuspecting bosses (sorry). Lauren was raised in Pittsburgh by an accountant and an English teacher, but she can neither add nor spell.